gospel-centered, disciple-making, church-planting missionaries to Taiwan. Are you interested in our mission? raising new support for the mission. We are gospel-centered missionaries. The bold proclamation of the gospel and the expositional preaching of God’s Word is our primary method for Kingdom expansion among the nations and our premier means of cross-cultural evangelism in Christ alone. We are church-planting missionaries. Where Christ’s message proclaimed, His disciples present, and His ordinances received, there is Christ’s church. Our goal is to plant self-supporting churches governed by Scripture alone and led by national pastors. We are disciple-making missionaries. Training up committed followers of Christ is an indispensable imperative of the Great Commission. Life-on-life discipleship is our primary method of preparing national pastors and nurturing new believers to biblical maturity by grace alone. Taiwan has an “unreached” population* of 4.4 million, and 3% of the total population identifies as "evangelical Christian." *Joshua Project defines the "unreached" as, "a people group among which there is no indigenous community of believing Christians with adequate numbers and resources to evangelize this people group without outside assistance." Taiwan ranks in the top 10 most densely populated countries worldwide. Taiwan needs (at least) 94 more missionaries to reach the “unreached” populations (that’s 1 missionary for every 50,000 individuals). Taiwan has the second largest unreached Hakka people group in the world—over 4.2 million. Taiwan is about 1/20 the size of Texas with nearly the same number of people. Taiwan has complete religious freedom as the "Republic of China." Taiwan has a free press and a GDP of $24,337 per capita ($530 billion ). Taiwan ranks as the 22nd richest country in the world (out of 188 economies). As a technologically advanced economy, Taiwan's main export is electronics. ...education exposed me to the gospel at an early age. Through the teaching of God's Word in a Christian school context, I learned of my dire need for Jesus Christ as my personal Savior. By the mighty workings of the Spirit of God in my young life, I realized my inherent sin was unacceptable before our holy God. By grace through faith, I placed my trust exclusively in my Savior, Jesus Christ. By the grace of God, I continued in the faith, attended church at every opportunity, and genuinely desired to grow in the knowledge of the God from the Bible. As a teenager, God was working in my heart tremendously. Under the constant preaching of God's compelling Word, God moved my heart to consider full-time ministry and missions work. God placed in my heart a desire for pastoral ministry, and I fully committed myself to train for missions and ministry throughout my teenage and young adult life. During those years of serving diligently in the local church, God often turned my attention to global missions. God used the startling realization of the unreached and my home church's international outreach ministry (Barnabas Society) to college students at Indiana University to considerably stir my heart for the glory of God among the nations. God continued to strengthen that course into global missions throughout my college days. Today the Lord continues to invigorate my soul to reach the Chinese people with the gospel. ...in my teenage years when I realized my need for Christ as my Savior. After accepting Christ. I became eager to learn about God through His Word. The Lord put in my heart a desire for ministry and to serve Him with my life. God continued to grow desire for missions during my college days. It was through preaching, God's Word, and missionary biographies that my love for missions grew. My heart became burdened for those in other countries who had never even heard of Christ. It was specifically in my second year of college when God stirred my heart for missions. I remember praying and telling the Lord that I was willing to go. Little did I know at the time, although God surely knew, that He was preparing me for the mission field. When I was in Taiwan for our six-month internship, God showed me the great need for the gospel in Taiwan. It was sobering when I talked to people who had never heard the gospel, but it was a great joy to share and explain the truths of God's Word to them! I look forward to returning to Taiwan with the heart and desire to share the gospel, disciple ladies, and be a helpmeet to my husband as we focus on planting churches for God's Kingdom. Ben and Natasha met and fell in love at bible college in 2008. Ben proposed to Natasha at Santa Monica beach, and a miracle happened, she said yes! Before their vows and life-long bond in marriage, they were already committed followers of Jesus Christ seeking to magnify His name with their lives indepenently—now they glorify God together as a married couple. At the start of 2012, they settled in Ellettsville, Indiana (near Indiana University) and began serving at their home church. They both intended to begin full-time fundraising for global missions work from the beginning of their lives together, but God mercifully redirected their steps to dig deeper roots in their local church ministries and grow in grace for the work He was preparing them to do. In May of 2012, God called Ben and Natasha to intern at Lifeway Baptist Church and serve alongside its pastors. Soon, God prompted the congregation to take Ben and his family on full-time as an outreach pastor. In 2014 their son was born, making them thrilled-but-terrified, new parents. By God's grace, Ben and Natasha have joyfully embraced the awesome responsibility of being a disciple-making parent. It is their God-given role and passion to raise their son in the knowledge of God through the teachings of Scripture. From 2012 to 2016, Ben and Natasha diligently and faithfully served 300+ members of their church and minister to countless more in their community through passionate evangelism, transporting children and families to church on Sunday, leading evangelistic events, and lovingly ministering to the sick and needy. Ben preached on a weekly basis to children, and, on occasion, to the entire congregation of Lifeway Baptist Church. With the assistance of church family and as a married couple, they labored together as a team to organize children's church and teach children of all ages about the glorious gospel and infinite fame of Jesus Christ. Then, in June 2016, God moved the Murrays overseas to Taiwan. Retrospectively, Ben and Natasha confess God's sovereign timing is always best, and they readily admit the necessity of practical ministry training—it prepared them for the next stage God had in store for them: God's Kingdom Work in Taiwan. Through the gracious financial support of their sending church, they lived in Taiwan for six months. 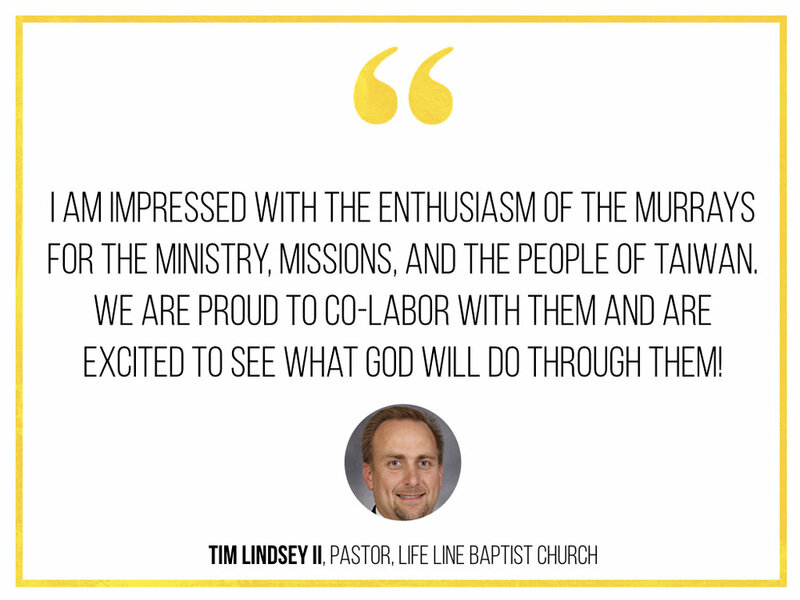 Through the mentorship of experienced missionaries already established in Taiwan, the Murrays began learning Chinese, serving in the missionary church-plant in Kaohsiung, and making disciples with English-speaking Taiwanese men and women. By the end of their short-term internship with Project China, they moved back to the States affirmed of their joint-calling as missionaries. In 2017, they immediately began the fundraising process with full intentions to return to Taiwan by 2020. Today, they continue to work full-time to raise the necessary monthly financial support from the God-enabled giving of churches and individuals committed to the spread of the gospel worldwide. As Kingdom ambassadors of the risen King, Jesus Christ, the Murrays are going to Taiwan. It is their goal to proclaim Christ, plant churches, and prepare national leadership for the glory of God and the advancement of God's kingdom. Through God's gifting, guidance, biblical counsel, on-going missionary training, and continual pastoral care, the Lord has solidified the foreseeable future course of their lives into foreign missions. Their prayer for their future ministry in Taiwan is for spirit-filled longevity and kingdom effectiveness. By God's enabling grace, they are committed to a lifetime of service to the Lord in Taiwan. With hearts of full of the overwhelming joy, they ask you to support them in this kingdom-worthy cause for the sake of the gospel and the glory of God alone. Will you support them with your fervent prayers and send them with the necessary funds for this God-glorifying cause? Ben graduated with a Bachelor of Arts in Biblical and Theological Studies. Ben is gifted to teach and preach. Natasha graduated with a Bachelor of Arts in Elementary Education proficiencies in biblical studies and musical education. Natasha is a gifted flutist. Anticipating God's directing hand to foreign missions work, both Ben and Natasha earned their TEFL/TESOL certification to teach English as a second language, if necessary. Ben is currently pursuing a Master of Arts in Biblical and Theological Studies entirely online through Phoenix Seminary, an ATS-accredited, theologically conservative divinity school, and he plans to finish his master's level degree by May 2020. Ben and Natasha share a desire to grow in grace in increase in the faith. They strive to add to their exegetical knowledge and practical application of Scripture for life and ministry. They share an avid eagerness to study God's Word and augment their studies by reading good books and referencing theological resources. They diligently apply themselves to be better equipped for evangelizing the lost, making disciples, and planting churches in Taiwan for the glory of God. Through monthly missions-training with Project China, the consultation of an Advisory Team, and theological training through ATS-accredited seminary studies, they continually prepare themselves to faithfully serve as God's kingdom ambassadors as they share and proclaim the marvelous truths of the gospel throughout each day of their lives. All creation is subject to the authority of the inspired, infallible, inerrant, and sufficient Word of God alone. The merit of Christ is credited to us by faith not works; therefore, we are made righteous by faith alone. Our salvation depends and rests solely on God’s unmerited favor extended to us by God’s undeserved mercy. By the substitutionary atonement of Jesus Christ’s life, death, and resurrection alone are we redeemed. All creation was created and is sustained by God and for His glory alone. All fame be to God! The New Hampshire Confession of Faith represents our beliefs. Our mission centers on the gospel. We believe that cooperation in the same gospel should be sought out for kingdom work. Our mission is committed to both financial and missional integrity and transparency facilitated through the guidance of our Advisory Team. Our mission maintains a gospel-relationship with our Advisory Team for the purpose of mutual edification in the faith and spiritual wellness. Our mission is dedicated to the expansion of the Kingdom through the mandate of the Church given by Jesus Christ our Lord and King. Our mission operates under the authority of Scripture alone and is commissioned through the local church. Our mission values a collective wisdom rooted in Scripture and facilitated through intentional conversations with our Advisory Team. By God’s grace, we are on schedule to return to Taiwan by 2020. Your giving helps achieve this goal. Global missions has a cost. Because of the infinite and supreme worth of Christ, we joyfully offer our lives for the sake of the gospel! Lifeway Baptist Church is an elder-led, deacon-served, congregational, independent, theologically conservative, Baptist church committed to proclaiming the gospel and making disciples for the glory of God. Project China is a network of missionaries committed to advancing God's kingdom through bold gospel proclamation, indigenous church-planting, and life-on-life disciple-making in China and Taiwan. We have been steadily building a team of advisors. The formation of this collective of leaders is to create an environment of greater missional integrity. United under the six core values of God’s Kingdom Work, they serve as advocates, advisors, mentors, and co-laborers. Prayer requests and mission updates are sent monthly. Unsubscribe anytime.